Abymes chapel, the main chapel in the area. Many varieties of palm trees and this is one of the most unusual. It grows this way and looks like a fan. Church sign in marble outside of the main chapel. One of our active members. Sarah is one of the first members we met here and she made us feel welcome from the beginning. She is the only member in her family and served a mission in New York, so her English is very good. She often interprets for me at church. She is a single sister and is very helpful to other members. She is one of the nicest people we have ever known. She serves a secretary for the District President, so we get to see her often. When we first arrived here, we talked with the District President. He wanted us to attend a small branch south of the main branch, to help them with moving from the building they rented into a new facility. He asked Gerald to oversee the transition. We had about one month to design the new place, get all the bids, obtain approval from the Church, hire the workers and get it done before the lease in the old place ran out. So we went right to work. They had already selected a place over a bank in the main part of town but it was only a large open room with only the two bathrooms in it. We measured it out and I designed rooms for the Relief Society/kitchen, Primary and several classrooms, plus the Branch Presidents office and clerk’s office. The chapel is on the side with big windows that open to the ocean/beach area, so it is a beautiful setting. We got the approval, selected a contractor and he got it done in a very short time frame. We were able to move into it on the Sunday after vacating the old place, even though the electricity is not quite complete. The members are thrilled with the new facility and we hope the church will continue to grow in that area. We have come to know the members there and appreciate their love of the gospel. Some of them are quite new in the church but have strong testimonies already. 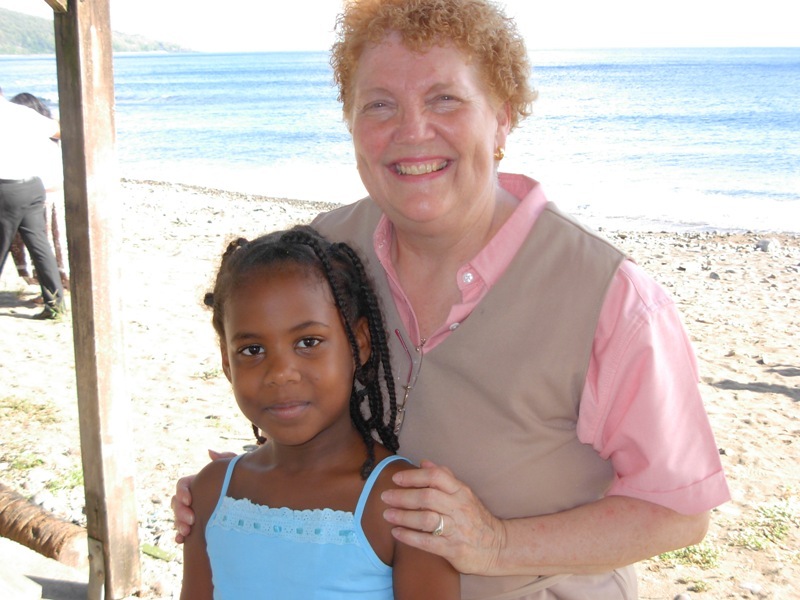 It is great to see how the gospel helps families and individuals. The pictures below were taken at the former meeting hall. Here the members and missionaries have a game night. Sarah and Sister Bonbon, members of Capesterre Branch. Daughters of our Relief Society President in Capesterre. Super nice girls. Apartment at Plaisance in Baie-Mahault. We looked for an apartment in several places but decided on this one. It is situated in the middle of the islands (Guadeloupe is shaped like a butterfly with two islands connected in the middle). 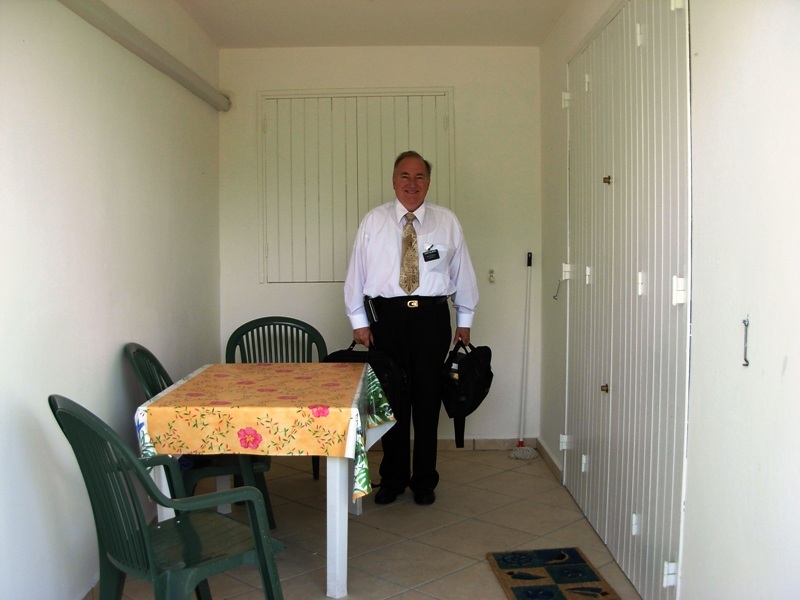 We wanted to be able to travel either direction because we have missionaries on both islands in several of the towns plus several branches of the church. The Elders took us around to several places but the one we liked the best was this one. It is a downstairs apartment in a private home and neighborhood. It was a little expensive, but one of the members talked with the landlords and told them that we were missionaries and weren’t rich (an understatement) so the wife lowered the rent for us. She also told them that she had had a dream that she should rent to someone who prayed. I guess that was us. We are very happy and feel safe here and the owners have been very helpful in many different ways, as we have settled in. Lord provided for us. 2.Our bathroom, yes we have indoor plumbing. 3. Our bedroom. We recently moved out desks into this room because it is the only room with AC. It is wonderful because the nights do no cool off much. 4. The main house. Note that most everything is made from concrete. It makes it hurricane proof, we hope. So far, there hasn’t been a hurricane here in several years. Hopefully, that will continue. Many of the windows do not have glass. They just use shutters. Gerald made some homemade screens to keep the bugs out. No one else seems to use screens but we are much happier with them. One of those things we took for granted. 6. Plaisance is the name of the little town we live in. 7. The grass does grow quite big as do most plants. The trees are huge too. Lots of flowers as well. 8. Looking to the alley by our apartment. The Elders occasionally ask us to go with them to teach investigators. Then, when they are baptized, they invite us to attend. At Abymes, the chapel has a font inside. 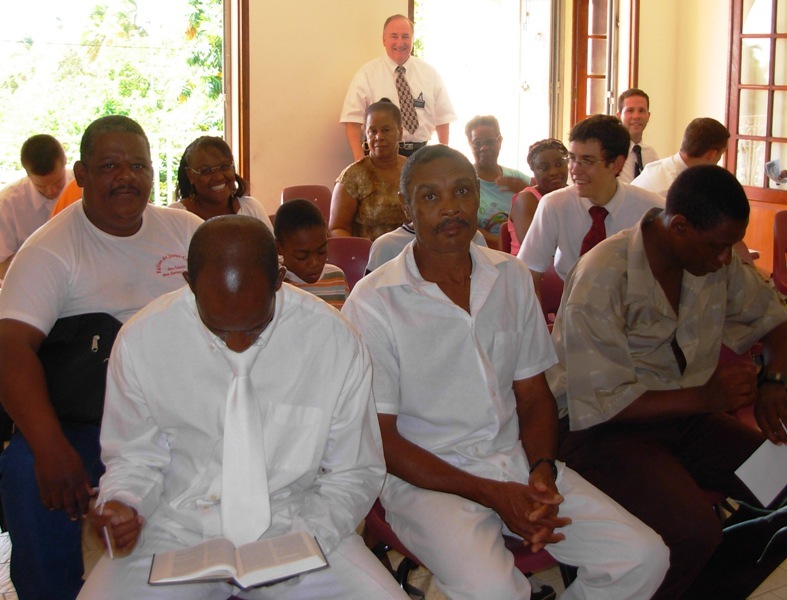 Picture of some new converts just before their baptism. View is in the chapel. At Basse-Terre at the end of the south island. Chapel is upstairs over a house. There are huge fruit trees such as mango, star fruit, cashew (did you know there is cashew fruit and the nuts grow on top of the fruit), We just pick up what we want and take it home. We don’t have a font, so baptisms are held at the beach. The water is so warm, it is nice. This is a picture of the shirt that members wear when they give community service. Member wearing the service shirt. One of the children in the branch at the ocean baptism. When someone is baptized, nearly the whole branch turns out to welcome them. As beautiful as this island is, there is much work to be done and that is what we are here for. This is NOT a vacation. We are busy learning what needs to be done to help the missionaries and the members. We do a lot of driving and have put many miles on the new car they gave us. Driving is TERRIBLE here. As nice as the people are, they are unsafe drivers. Most every car has dings and dents. It is just wild. I will not drive unless it is an emergency. Gerald, on the other hand, has become a Guadeloupian driver and does very well in the survival of the fastest or the game of Chicken that must be played every time one drives. It is crazy. There are English and Dutch zones in the West Indies as well but we are assigned these Elders in the French zone. They haven’t had a senior missionary couple here in 20 years so they were really glad when we got our visas. We take care of a lot of the logistics such as finances, health advice, transportation along with counseling and helping as needed. They are a super group of young men. Most of them are from the U.S. but some are from France, Tahiti, England, and a few from these islands. Most of them serve here in Guadeloupe but we have four Elders on Martinique, as well. We have them come to a Zone Conference every six weeks. These pictures are from the last zone conference. This is our French Zone in the West Indies Mission. Elders in a lighter moment. (They are still very young). Balcony at a hotel near here. President and Sister Robison, our mission president at their hotel.